Using science to find your solution. Experience to do the job right. Having disappeared for nearly half a century, bed bugs are not only back, they’re here with a vengeance. Bed bugs are infesting commercial facilities like hotels, housing authorities, colleges, and hospitals, just to name a few. At Burgess Pest, our commercial bed bug team implements a 3-part plan to assess, detect, and correct with several treatment options. Thermal remediation and conventional applications effectively eliminate bed bugs, while our on-going assessment and staff training helps to avoid reintroduction. Termites cause more than $5 billion in damage per year in the United States alone. Unfortunately, many commercial facilities are infested, but no one knows until it’s too late. Burgess Pest is one of the elite companies authorized to use the groundbreaking Sentricon Termite Colony Elimination System; the most advanced termite system in the history of the industry. The basic science behind it leverages termite biology and behavior to eliminate the queen without the use of harsh chemicals. So many pests thrive in conditions that are unsanitary. Implementing sanitation services helps to stop a pest infestation at the source. Non-toxic products and natural enzymes can help break up organic matter in drains and grime buildup on floors and surfaces, helping to stop an infestation and remove the source of odors. Commercial kitchens, warehouses, distribution centers, and many other areas are susceptible to fly problems. Fly lights, pheromone devices, and exclusionary measures can help avoid the risk of contamination and the spread of diseases and bacteria resulting from flies. The threat of tick and mosquito-borne illnesses and diseases is a risk you simply cannot take when it comes to protecting your employees and customers. The Burgess Tick and Mosquito Team uses a 200-gallon hydraulic sprayer to blast away breeding grounds with a low-impact residual barrier treatment. 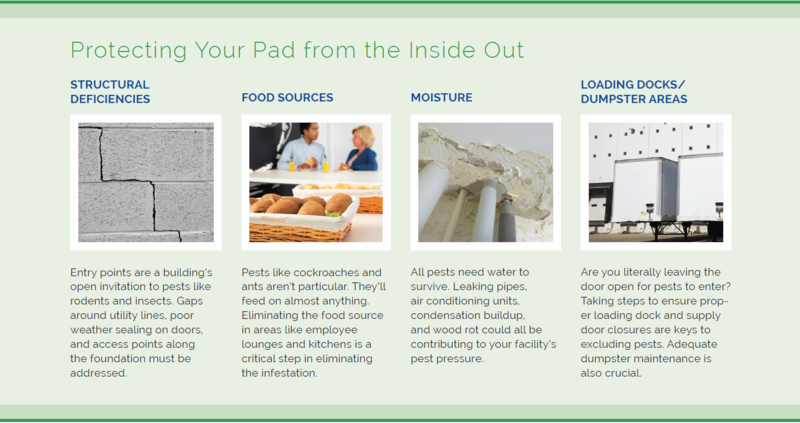 Keeping pests where they belong—outside—is a key strategy in reducing pest pressure. Sealing openings, installing one-way doors and screening devices, and recommending weather sealing are all part of the mission to keep your pad protected from the inside-out.